As the time was coming closer to have my second child, who was born last month, I was coming closer to the dead line to get my daughter a big sister gift. I remember watching a home video of when my sister was born and how the first time I went to the hospital there was a big sister gift waiting there for me from my new baby sister. I loved watching how excited I got when I reached under the baby bin and found a baby (doll) just for me and I knew that this was something I wanted to do for my daughter. The search for the perfect doll was a hard one. I didn’t want to give her something too simple but I also didn’t want to go with a doll that was too real, those are too creepy for my husband, so I had to find the perfect medium. That’s when I found the Babble Baby from Madame Alexander. It was the right amount of real without scaring my husband every time he saw it. Babble Baby Doll from Madame Alexander. 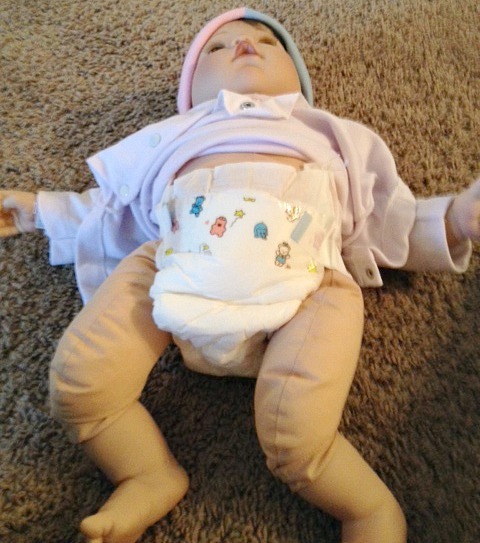 This doll is fun for my daughter because it makes her feel like she is involved in taking care of someone while I have to take care of her little brother. She can pretend to feed the baby, change the baby, hold the baby, sing to the baby, and do pretty much anything with her baby that I do with her brother and more because she can drop her baby without it causing any lasting damage. The Babble Baby fits into a size one diaper perfectly and that is great for our daughter because those are the exact ones we have lying around…. all over the house! The Babble Baby weighs 3.5 pounds, so heavy enough to make it feel like a real baby but not heavy enough to be too heavy for my daughter to hold, and is 19 inches long. It also has a full head of hair which is perfect for our family because all of our babies were born with lots of hair. The makers of this doll also did a very good job at the face of the doll, such a cute expression and adorable big brown eyes. The video above is a demonstration of the coolest feature about this doll. The Babble Baby babbles like a baby (try saying that ten times fast). It has over 80 baby sounds that it makes and all you have to do is say something and it will coo right back to you. This is a very cute feature. 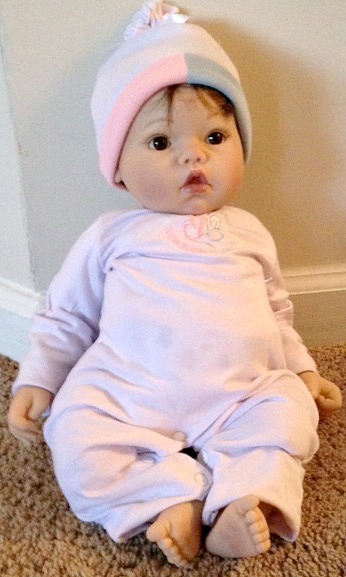 This is a doll I recommend to any expecting mothers with older children. It is a great way to keep them involved while you are busy with your newborn.